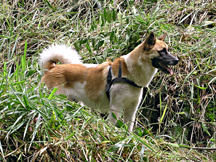 Shadow was a beautiful, intelligent and playful Akita. We named her Shadow because she followed us like a shadow. We bought her as a young pup and, like most young pups, she enjoyed chewing on furniture and otherwise being mischievous to show her displeasure when we left her alone for a few hours. 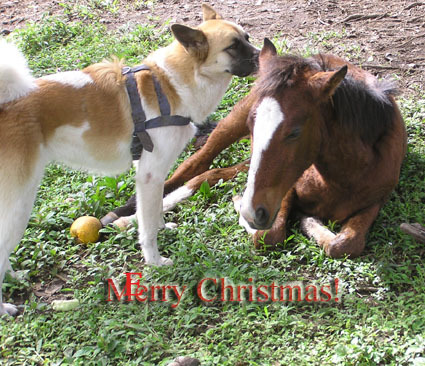 As she matured, Shadow taught our other pups and young horses how to play. When our pup Honey got pregnant before we had been able to have her fixed, Shadow ignored the pups for a time; then, one morning I saw the pups lying in a semicircle facing her in our yard. Also lying down and facing them, she was gesticulating with her front paws and had to be telling them something, to which they were obviously quite attentive. When one of our mares gave birth, Shadow greeted the foal before Jeanie and I got there. 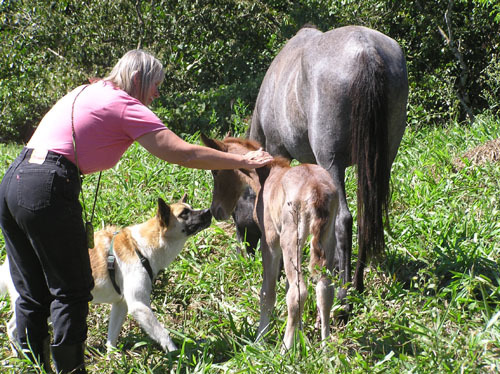 The foal, only a few hours old, displayed no fear of Shadow; neither did Sizler’s mother, Pimienta. Shadow had full run of our finca and enjoyed “helping” to train our horses. She and Daisey took turns chasing each other while I worked with Daisey. It was a distraction, but a welcome one. Here is a photo of Shadow whispering something to Sugar, Daisey’s foal. They also enjoyed taking turns chasing each other around the fields. 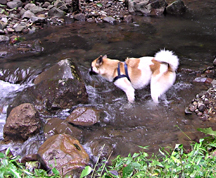 Shadow also loved to play in the creek and that was her downfall. She managed to escape our rental house one night and didn’t return until morning. She had apparently gone to play in a nearby creek where snakes gather at night to hunt. She was her usual happy self and greeted us by jumping almost as she always did, but she was limping because something had happened to her left hind leg. She deteriorated until her next and last night, five years ago today when, at 2:06 a.m., she ceased to breathe and her heart stopped. She died despite the best efforts of a friend, a veterinarian, who had come twice to check on her and had then spent the last night on our sofa so that she could be there to help. 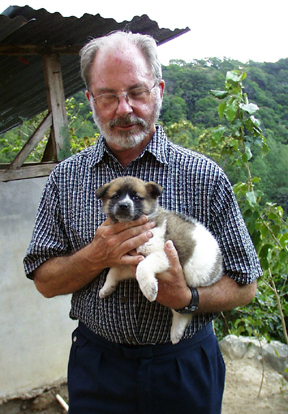 Shadow had been bitten by a snake, known here in Panamá as an Eques, or Xs, a close relative of the fer de lance, whose venom attacks the muscles that control respiration, heart action and other functions. We buried her at her favorite place on our finca, just outside a thatch roofed shelter where we had often gone to rest after working with the horses. Flowering bushes mark her grave. and miss you beyond words, and always will. The day we buried Shadow, we visited the kind lady who had bred Shadow and had sold her to us. We had heard that it is a bad idea to acquire another pup soon after the death of one we had much loved but things didn’t work out that way. We all hugged and cried a bit about Shadow and then she gave us one of Shadow’s half sisters, from the same mother but by a “finca dog” (a mut). She had a regal bearing, even as a pup, so we named her Princess. She has lived up to her name and resembles Shadow in many, but not all, respects. Loving and quite athletic, she lacks much of Shadow’s great playfulness. We asked the lady to let us know when she had another pure Akita and when she did, we bought her. In memory of Shadow, we named her Sunshine. Sunshine also resembles Shadow in many respects, particularly in her playfulness and loving sense of humor. 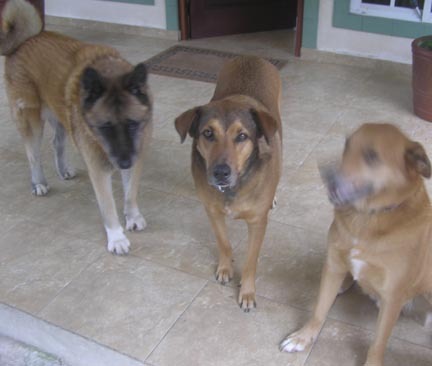 Here is a photo taken yesterday of our three dogs. Ruff, one of Honey’s pups, is on the right; he moved his head but then he often does things like that. 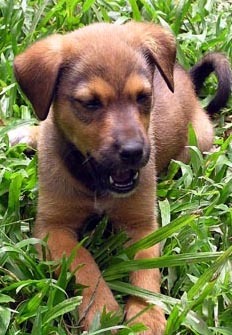 We named him Ruff because, when I asked him to tell me his name, he said “ruff.” He is exceptionally sweet and gentle. Princess is in the middle staring at you — she always does that — and Sunshine is on the left. Blind in one eye, she doesn’t stare a lot but manages to navigate around the house and the finca quite well. All three pups sleep on their own mattresses in our bedroom and, when the Sun appears, they gently awaken us to the new day. Ruff comes and asks to be patted on the head, Princess kisses us on the face and Sunshine mouths the bedspread as though she were dealing with fleas on it but in reality is pretending to try to remove the bedspread. Nicely done, Dan. I’ve always loved animals, and while I was growing up there were almost always dogs around. Some of them I remember much more fondly than many people I’ve known. Horses, too, and although I’ve never owned one, I rode a lot when I was a kid. I never thought that much of cats, and how I’ve come to live with one for the past 10 years is a long story. As they say, I wouldn’t take a million dollars for him and wouldn’t give a dime for another one. Dogs,and horses,best two things on earth. They are like your children,only better,because they need you, teach you,adore you,never leave you alone,seldom sass,never get into bad trouble,that requires you to mortage your house, and you can leave them alone,without a sitter. They are loyal friends whose only thought in life is to eat,and please you,they only leave you when you send them away, or they die. Cats on the other hand,do not need you, but like your company on occassion. All three are great friends and companions,I don’t know what we’d do without them,it would be very lonely. No problem seems so huge, when you are on the back of a horse, or when your dog sits quietly by your side,seeming to know you are suffering. My condolences,been there,done that, far too often. I think the saddest day of my life,was when my best friend,and my true and loyal companion,Mariah,the half Arab mare died. It was 18 years ago,but I think,I will never forget,and I know I will never get over it. We agree on this one, as I knew we would. The five years have passed rapidly, too rapidly, and Jeanie and I both think of Shadow daily. I pass Shadow’s grave multiple times each day and each time I have a few of words for her, perhaps hoping that she will have some for me. Sometimes, I think she does. Here is a story about two military working dogs. Reading it, I found it necessary to wipe a bit of fog from my glasses. That’s a wonderful story, Dan. I, of course, got no fog on my glasses at all. Nope.